China has signed 16 agreements with Ethiopia during the state visit of Chinese Premier Li Keqiang, including an $80 million deal by Chinese telecom giants Huawei and ZTE to lay optical ground cables to form Ethiopia’s nationwide network. 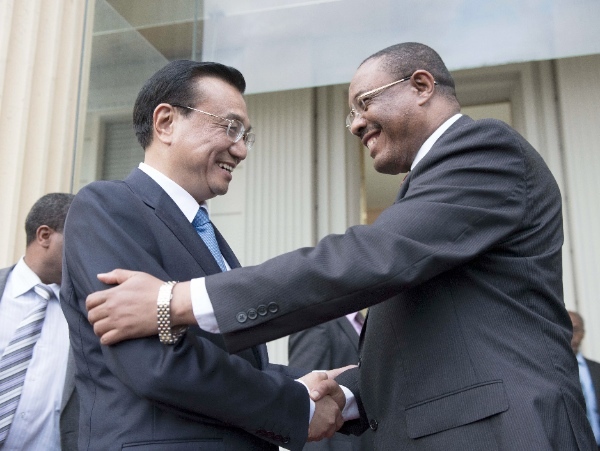 “I believe the cooperation between China and Ethiopia will bring real benefit to the two countries and two peoples,” Li told reporters after witnessing the signing of the documents with his Ethiopian counterpart Hailemariam Desalegn. “We are willing to see Ethiopia moving fast and steadily on the track of development and make greater achievements in its efforts of poverty reduction,” Li said. The Chinese Premier will visit the African Union’s headquarters in the Ethiopian capital Addis Ababa and address African lawmakers on China’s Africa policy on Monday. “We believe Africa deserves an important place and should have an important role in the international political landscape,” Li said on Sunday. “I wish to assure our African friends in all seriousness that China will never pursue a colonialist path like some countries did, or allow colonialism, which belongs to the past, to reappear in Africa,” he added. Li will travel to Nigeria, Angola and Kenya to continue his four-nation Africa tour, his first since assuming office in 2013. Beijing will upgrade ties with the continent by signing infrastructure agreements in the road, railway, aviation and electrical power sectors this week. Erastus Mwencha, deputy chairperson of the African Union Commission, on Saturday urged Beijing to provide greater support to Africa’s peace missions. “China has been at the forefront of Sudan mediation and very supportive to our efforts to end this conflict. It has also supported those affected on the ground. China has also been supportive in the cases of Mali and Somalia, as well as the recovery and development of countries that have just emerged from conflict,” he said.